I spend this weekend watching Netflix’s The Defenders from the comfort of my squashy red armchair, alternating between chuckling at Krysten Ritter’s facial expressions and groaning whenever Finn Jones gets melancholy. By the end of it, I had developed a sort of chuckle that was half-groan: an exhalation of joy that was comingled with the recognition that what was giving me joy was, quite frankly, pretty mediocre. The whole point of this team up series, from the get go, was the promise that the storylines of Jessica Jones, Iron Fist, Luke Cage and Daredevil would all run headlong into each other and merge. We’d see them go through the standard teambulding friction, we’d see personality clashes, but we’d see them really bond and form a ‘family’ (because Guardians Vol. 2 didn’t belabor the point enough, apparently). The villains that they’d all been chasing would reveal themselves and suddenly we see that The Hand is scary and oh my goodness they’re on the same side and what will happen to New York. It’s melodrama, first of all. For all of The Hand’s purported scariness, Luke Cage is basically ninja-proof. We’ve already seen that Daredevil is himself a ninja. The Iron First is supposed to have mastered the mystical powers of kung fu, and Jessica Jones can just about get hit by anything short of a car and be just fine. It’s more or less the same problem that the Luke Cage series ran into – how do you beat the unbreakable man? They did it by introducing alien weapons from “the incident” and playing on his emotional/mental side. But in The Defenders, the only way the writers found to present a real threat to superpowered individuals was to have supernatural individuals show up to the fight. Madam Gao, who’s been around since Daredevil’s first season, has some weird telekinetic palm. Murakami, Bakuto and Sowande are all essentially stronger, tougher, essentially immortal ninja types. And Alexandra, their leader, the baddest of the bunch, is also a scary fighter. None of this seems insurmountable or impossible to deal with. When Elektra shows up as the Black Sky, she is effectively the only threat to The Defenders, but Matt Murdock plays the part of the plucky love interest and she ends up foiled for half the damn show. It’s a little maddening, to see a comic book series about hometown heroes have not only mediocre threats to deal with, but to have the big threat hamstrung by one character. Well, if we’re being honest here, there is another character who kind of weakens/ruins/performs badly in The Defenders. Danny Rand, the immortal Iron First of K’un-Lun, is possibly the worst TV superhero I’ve seen, and I saw the made-for-television Captain America where the Red Skull is Italian and Jimmy Carter makes a cameo. The acting is painfully bad. The writing is painfully bad. The best moment his character has is in the Chinese restaurant and he orders four of everything. Luke Cage sums up his character in episode two, when he calls Danny out on his privilege and forces him to really reflect on his motivations. Look, the character of Danny Rand/Iron Fist is a pretty direct parallel to Bruce Wayne/Batman. Both lose their parents and swear revenge. Both train in kung fu. Both are billionaires that continually have to clean house in their respective companies to make sure a secret criminal organization doesn’t use it to rule or destroy the world. The key difference is, of course, Danny has the Iron Fist, the magical chi-powered weapon that breaks swords and scatters people like confetti. Bruce is just the world’s greatest detective and has a contingency plan for every imaginable scenario. The upside – viewers think Danny is dumb because he lacks the intellect and mental reasoning that Bruce has. Colleen Wing, his sidekick/lover/ninja buddy calls him out on this as well, essentially stating he’s not too bright. He’s more of a fighter than a boardroom negotiator. He stops hostile corporate takeovers by, well, being hostile. But let’s get back to how badly he affects The Defenders. One discussion I’ve heard is that the Iron Fist basically allows for the existence of magic in the gritty, crime noir cinescape of New York that the other three series developed. It also shoehorns the plot of Daredevil neatly into the plot of the Iron Fist, but it’s not quite so neat with the other half of the team. Jessica Jones literally gets thrown into it, just happening to take a case that involves the crazy architect and which leads to Elektra happening to kill him in Jessica’s apartment/office. Luke Cage gets out of prison, and yes, he wants to get back to Harlem, get back to what he was doing before he was arrested. But Mariah and Shades have conveniently “ghosted” as they say, and he’s left to be guided by Misty, who just happens to need his help with Harlem’s youth, who just happen to be working for The Hand. I get that the point is that none of this is coincidence, that it’s all part of The Hand’s master plan, but in eight episodes, you don’t get the rich reward of the aha-moment that might have occurred had the groundwork been laid in their respective shows. In this series, it all comes together in a few scenes across maybe three episodes. By episode five, the entire plot is laid bare and we’re just waiting for it to end. Yes, worlds are colliding, but it’s sloppy. The Defenders effectively trades nuance for fisticuffs. 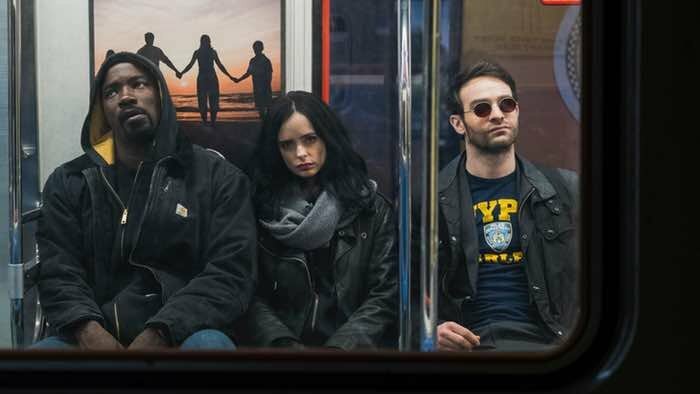 Jessica Jones, Luke Cage, and Daredevil didn’t have to make that choice – it was already built into their narratives, already a part of what their characters were and were doing. But the choice had to be made for their team up. And it’s because of the Iron Fist. Don’t get me wrong, the fisticuffs are delightful. It looks like the fight choreographer from Daredevil lent The Defenders a few notes, because the long shots, the long fights, the angles and the hits and the whole bloody event is pretty damn wondrous. I’m not sure why so many people are losing limbs (Stick, Misty, that kid in the wheelchair from episode one), aside from making a conjecture at a terrible “the hand” pun. The beautiful thing about long-form TV series, though, is how they give you time for both nuance and fight scenes. Character development is essentially nonexistent in The Defenders. Luke Cage’s moral dilemma about blowing up buildings in New York is resolved in minutes. Matt Murdock’s desire to change, to leave Daredevil behind, vanishes precisely because the argument behind it was flimsy to begin with. Jessica Jones leaves the Chinese restaurant, ostensibly because she’s “done with” the hero shtick, but she spends the evening doing research on a computer and suddenly she’s knocking Alexandra over with a car, rejoining the group. I understand my criticism are part of the larger criticism that faces superhero movies and TV shows these days, that they market to an audience that doesn’t care about the quality of the story as much as they care about the quality of the image of the story, but it’s an important point to underline. Comic books give you character development over hundreds of issues. The point is to show marked change over time. If the events of The Defenders are to be seen as significant, there needs to be a more significant fallout than dismemberment for the background characters, or a real consequence to the narrative. To end on a positive note, it’s important to highlight the special roles of the women in The Defenders. Sigourney Weaver’s role is impeccable, as the immortal Alexandra who rules New York. Rosario Dawson as Claire Temple is still really, really good. Carrie-Anne Moss as Jeri Hogarth, Krysten Ritter as Jessica Jones, Elodie Yung as Elektra, Simone Missick as Misty Knight – it’s a really incredible lineup of characters, both principal and background. Some of them deserve a lot more screentime than what they got. Some of them deserve better writers, too. There are themes of motherhood, daughterhood and sisterhood that bear exploring, diving into, to provide more color and depth to the world of The Defenders. Because New York is their home, the place they live in and defend. And almost 52% of the city is female. They are magnificent in their city, the heroes and the villains. If anything saves The Defenders, if anything could serve as a bulwark against further criticism, it would be the women.